Everyone’s opinion about how long a flight has to last to be considered long-haul is different — but whether you regularly hop an eight-hour red eye to Tokyo, settle in for 14-hours to LA or fidget through a two-hour jaunt up the coast there are a few tricks and tips to make time spent in the air as painless as possible. RJ and I regularly cross the globe (as often as possible yet not near as much as we’d like) and other than an occasional points upgrade we do it in economy, saving our dollars for food adventures on the other end. As such, BYO comfort is a must and pre-planning can be the difference between hitting the ground running and losing the first few days to jet-lag recovery. So without any further ado please fasten your seat-belts low and tight, raise your window shade (sorry, it had to be done) and prepare for 10 ways to rock, or at the very least survive, your next flight. You’re heading into another time zone and you may as well start acclimating before you even set a foot on the ground. Changing your watch means you can focus on sleeping for where you’re headed and arrive reasonably refreshed (if landing in the morning) or ready for bed (if landing at night). In-flight entertainment has majorly evolved from the days of a single movie projected onto the wall of the bulkhead. My first order of business on any flight is to see what’s on offer (movies to pass the time, cooking shows and fashion documentaries to lull me to sleep) and weigh-up what will keep me amused and distracted in equal amounts. Of course a good magazine or two (food related of course) is a nice to have when the cabin lights are on and you don’t feel like donning headphones, and if you’re a tablet devotee you may have movies and magazines covered in your own device. Accessibility is everything on a flight and the last thing you want to do is climb over seat-mates and dig through the overhead bin every time you need something. Best bet is to store your larger bag in the overhead and have everything stashed away in your smaller “personal item” at your feet, but an equally good solution is to pack a smaller bag into your main carry-on and pull it out before you sit down. 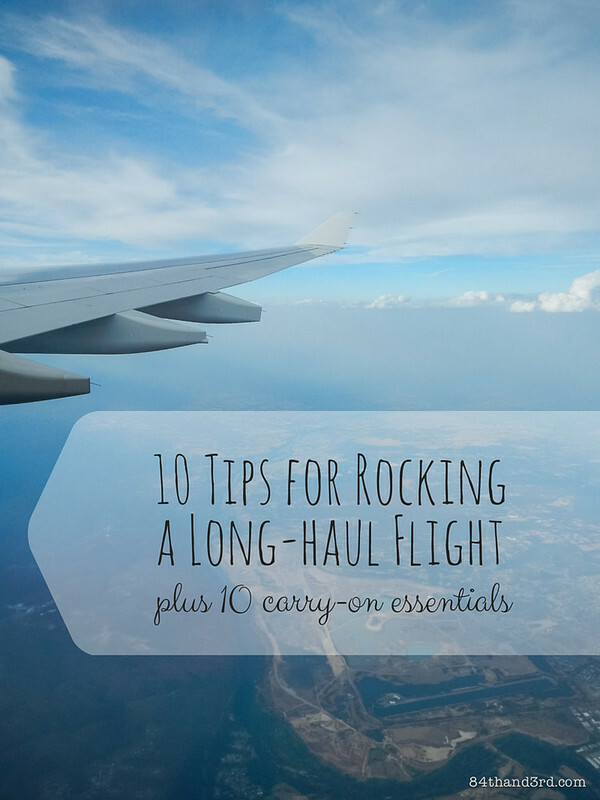 Make sure to check out my 10 Carry-on Essentials list when you’re done here! Almost all planes can accommodate personal headphones these days and a set that fits your ears is invaluable when you’re wearing them for hours on end. If you have carry-on space the noise cancelling ones are a worthwhile investment, but for space savers ear-buds are a highly portable solution. A dual-pin plug adapter is also a great way to ensure everything works as it should — mine is from an airline set (shhhh!). If you’re going to be sitting and sleeping in a reasonably upright position for an extended length of time you’re going to want to take your shoes off. Aside from wearing non-smelly shoes (seriously, don’t be that person) an extra pair of traveling socks can be the difference between cold feet and a comfortable trip. Wool or thick cotton are best, and make sure they’re a bit longer so they cover your ankles too. I know, it’s free and you’re bored and it seems like a good idea at the time but drinking alcohol on a long flight is one of the worst things you can do. You know a drunk sleep is never a good sleep no matter the location and waking up from a mini-wine-bottle induced coma at altitude is a special kind of torture.Yes, there’s an exception to every rule but unless you’re 21 and heading to Cancun for Spring Break, stick to the mineral water — your body will thank you. It’s important to move around every so often, as much for the avoidance of DVT as for your own sanity. Of course you don’t want to be doing laps or climbing in and out of your seat every 10 minutes but a couple side stretches while waiting for the bathroom and some in-seat leg raises during movie number two will make a world of difference to your muscles. Yes, pack snacks, lots of snacks, because while airplane food is generally on the improve the comforts of home (and of your own diet preferences) are a sure-fire way to reduce the pressure of spending half a day on a plane. Remember that you probably can’t take said snacks through customs on the other side so only bring what you plan to eat. My must-haves are apple wedges, carrot sticks, mixed nuts, cookie bites, granola and (if I’m packed in time, yeah right) a sandwich. I bet you had no idea that you’ve been wearing your crescent-shaped neck pillow the wrong way all these years. Yes it seems logical to put it on like a shirt collar but then your head falls forward and defeats the whole purpose.The seat will support the back of your head so pop the pillow on the other way around — you can rest your ear on the side and when your head inevitably falls forward it ends up on the curve of the pillow instead of buried into your chest. Life changing, I know. This is easily my top tip and really does make a world of difference. Sipping of hot water is an old Ayurvedic trick and it’s not so much about the amount you drink but the regular consumption that aids digestion and helps to clear toxins from your system. On a plane it has the added benefit of keeping you hydrated (airplane air is terribly dehydrating) and if you breath in the steam for a few minutes while waiting for the water to cool down enough to drink it will help keep your sinuses and throat from drying out too. I usually ask for hot water during the first meal service then get up and refill the cup every hour or two (sleep and movie dependant) — which also does double duty for keeping the blood flowing. 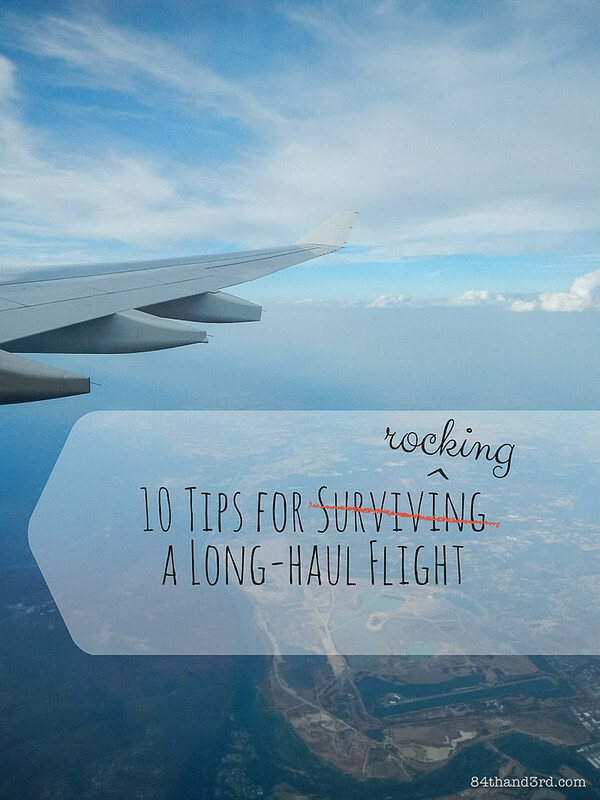 So those are our tips for surviving long flights, I’d love to know if you have any more to add! 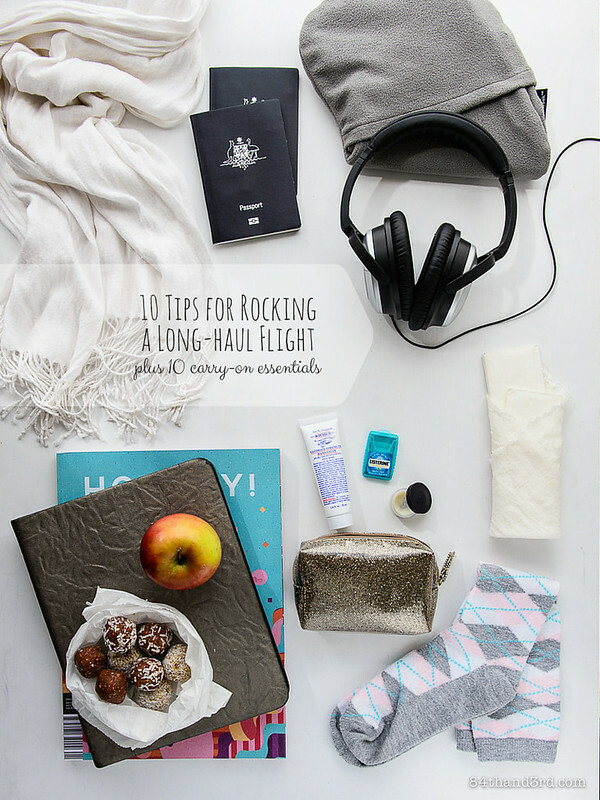 And don’t forget — before you race out the door to the airport there are a few items that make the aforementioned under-seat carry-on worth the valuable space it takes away from your feet. 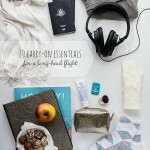 Make sure to check out my 10 Carry-on Essentials list, and have a great trip! Wear my neck pillow backwards??! Pure genius – I have no idea why I haven’t all these years. Will try it for sure next time. Looks funny, works like a charm! These tips are fabulous. I am a dreadful traveller and have only ever had horrible experiences on long haul flights. I am saving this for (whenever there is a) next time. Great tips. Thank you JJ. Will definitely try the hot water one next flight… though I can’t say no to a cheeky whisky on the flight!